After a long day at the beach, shake off that sand and get ready for Montauk’s legendary nightlife! During the summer months, there are more than 50 active bars in Montauk, many offering live music. It’s impossible not to find something to suit your tastes. The Montauk Chamber of Commerce sponsors weekly free outdoor concerts during the summer months, and the Montauk Library also offers free concerts throughout the year. Of all the towns and hamlets in the Hamptons, the most lively summer nightlife is in Montauk. This is because Montauk has more bars and restaurants than other East End towns, as it is a real seasonal, summer resort, offering not just nightlife but the best sport fishing, beaches, camping, horseback riding, shops, and water activities. The nightlife in this “last resort” runs the gamut from lone singers in tiny bars, to Karaoke (packing in 200 people), to beach bands, Spanish bands, Reggae sunset dances and more. 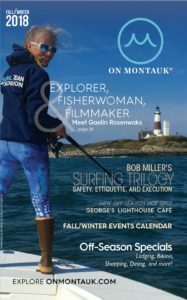 There is something for everyone in Montauk, where people come to unwind and party, and 2017 promises to be a great summer. So here is a list of some of the over 100 bars and restaurants where you can go to enjoy plenty of good food, drinks and dancing. Come out for a laid back night with delicious drinks—new to their menu is locally owned whiskey called Montauk Hard Label—the blueberry is a fan favorite. Lots of live music—especially on weekends. It’s a popular spot for day drinking or after dinner drinks to start your night out. Has another long list of live music—starting with “Acoustic Sunsets” which begin July 4th Weekend, and include national music acts. Solé East features DJ’s around the pool on Saturdays and Sundays, and live music nightly in the restaurant. They also have a Brazilian Brunch on Sundays, with live Bossa Nova music. Drink Specials include Montauk Beers $4, House Selection of Red/White/Rose $8, Well Drinks $10 and the Cocktail of the Day $7. A true fisherman’s bar down by the docks—most people know it as a great after-hours spot but a Lair’s mudslide taste even better on a nice day sitting on the back deck over the water. Don’t miss Karaoke nights every Friday all summer long. The word’s out on this hidden gem. The Montauket is the most instagrammed sunset in Montauk. Perched on a hill overlooking Fort Pond Bay. The Montauket Restaurant and Bar is one of Montauk’s oldest night spots, with the best sunsets in town. Enjoy a night out at Muse with live entertainment and daily happy hours until 6:30pm ( 7 days a week 5- 6:30pm). Lounge / day beds in the sand of Fort Pond Bay. Good for a boozy lunch along the beach or sunset cocktails. Montauk’s favorite sports bar. Go during a game for a local crowd and the coldest beers in town. Half-priced drinks and appetizers on Monday through Fridays from 4-7 p.m. Monday’s also feature live music with “Todd the Guitar Guy” from 10:30 p.m., and on Tuesdays, come for “Tuesday Trivia,” with Marc. On summer and fall weekend nights, it turns into a packed dance party. Home of Sloppy Sundays. (Drink specials on summer Sundays). Sail Inn Bar and Restaurant, at the docks, will have live music and Karaoke on Saturday nights this summer, with drink specials and a great bar crowd.